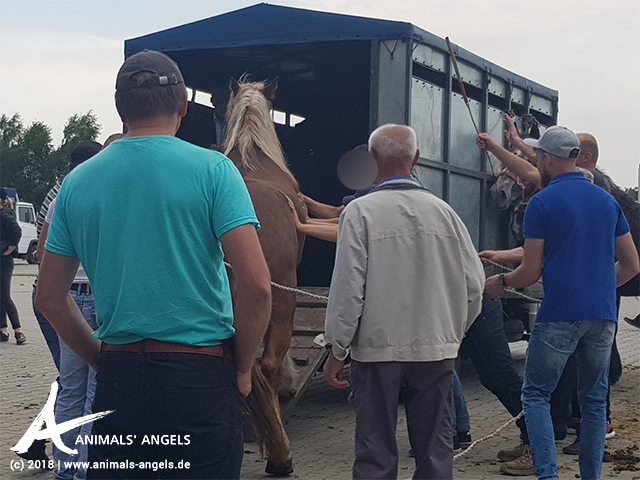 12-05-2018 Animal Markets Poland Created by Animals' Angels e. V.
The team of Viva! Interwencje, on behalf of Animals' Angels, inspects the large horse market in Pajeczno. Many horses are loaded on slaughterhouse trucks and many farmers are drunk and reckless. By the end of the market, the horses are tired of standing for several hours in the sun. The vast majority of farmers do not use the loading ramp, forcing the horses up the steep ramps of their trucks. The supervising veterinarians try their best, but the prevailing problems seem to be beyond their powers. Viva team will present their observations to the mayor of Pajeczno and other competent authorities.